Are You Ready for Monday, Aug. 30, Service Restoration? 1. Download Google Maps to your smartphone, if you haven’t already, and test out your typical trip. If you haven’t downloaded the Google Maps app for your smartphone, now is a great time to try it out. You can use the layered feature to test out different routes and nearby stops, and to experiment with varying times. And if you don’t know the address where you are, the GPS feature on Google Maps can plan your trip from your location. Type m.google.com/maps in your phone’s browser, or send the app to your phone. You can also use Google Maps from your desktop or laptop computer, and TripFinder is still available from our website. 2. Download and print route maps and schedule information. All of the service changes, plus the overall service change brochure, is on the service change page. Also, you can pick up schedules at Metro Headquarters. 3. Give yourself extra time. With so many changes for both bus operators and passengers, schedules may take time to normalize. Please give yourself extra time to get to the bus stop early, and expect possible delays. What to do if you get lost or miss a connection? Even with careful planning, there is always a chance you could get lost or miss a connection and need to figure out what to do next. Here are some options to help you find your way. 1. Customer service. The Metro Customer Service line will be open as usual from 7:30 a.m. to 4:30 p.m.
2. 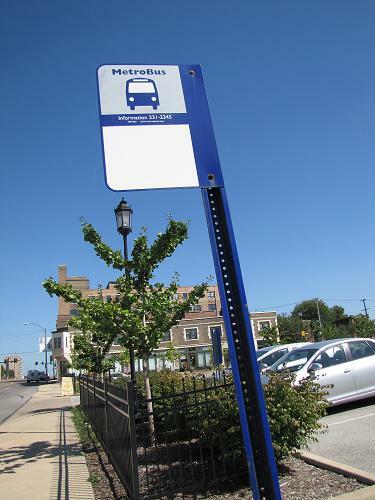 Email transit information questions to transitinfo@metrostlouis.org. 3. Via Twitter use “@STLMetro” with your question. We will be available with a Google Maps app and transit information to help Twitter users. 4. Locate a Transit Service Manager throughout the system. TSMs and other available personnel will be out Monday to help customers. TSMs wear yellow Metro polo shirts, and Metro ambassadors have white Metro polo shirts. Also, please help one another. If you find someone on your bus who is confused or needs some help, please consider reaching out and lending a hand. You may just make someone’s day. And as always, you can leave a comment for one of the blog team members to help you out. Thanks so much for all of your feedback and discussion. I m pleased tyo see that Heege Road once again has service. That road hasn’thad service in ages! I hope more runs get assigned to that route as there is an attraction on that road known as Tower Tee Miniture Golf Course. Plus the extention of the Lindbergh running on Foder Road 7 days a week providing additional service to South County residents who want to shop South County Mall or visit Kirkwood. I am abit annoyed that the service on Lindbergh plans to be split for good. Planning states that is to save money. I say that is garbage. If there is enough money to extend the #32 into Maplewood, that extension is equivalant to what the #40 used to be before the split. My goof, the #32 is now as long as what the #49 used to be before the split. I was ready but Metro wasn’t. Not once has the bus (I am talking about 33) been on time. Its come 10 or so minutes late, makes me miss the metrolink and has me running to get to my classes on time. Also, the metrolink seems to be running late at least when I need it to come on time the most. When I was waiting for the bus to come to the station so I could go home, the bus didn’t even arrive until it was supposed to leave. Then the bus driver took another 10 minutes talking on the phone (hopefully complaining about the very thing I am talking about since I know she was talking to someone from Metro). I don’t see why you guys added Ameling. The bus schedule was just fine as it was before the 30th. Now the bus always arrives after the most convenient train goes by. On top of the fact that the bus is 10 minutes late which has me almost missing the next train. Either start running 33 every 20 minutes (I am not leaving at no 6:30 for a class that starts at 8:00) or go back to the old schedule. That or just fix the schedules. Just do something because its not working right now and its irritating having to run up a hill with a heavy backpack. I’m so sorry that you’re having problems with connections on the #33. Just as an FYI, whereabouts do you catch the #33? I am collecting comments for the planning department, and your feedback is really important in understanding how the changes are working. Thank you for your feedback. Route splitting was explored to help improve on-time service for some of the longer routes that had a much higher concentration of people riding on one end of the route than the other. Also, smaller vehicles could be used for these lower ridership routes. It is not to be deceitful or dishonest, I assure you. That being said, I am collecting all of the comments from the changes to be used for evaluation, as well as all the calls, emails and personal meetings that we receive. Your feedback is a very important component of figuring out what works and what does not. I catch 33 on Woodson. And so far its still late. But the train was on time today thankfully so I didn’t have to run to class though I still only had less than 15 minutes to get from the station to the south campus classrooms building.